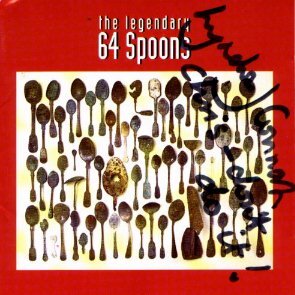 Since 64 Spoons music has always remained an important part of my life - but somewhere in there I gave up playing the bass in favour of the Baroque flute - a real musical instrument as Ted will testify. I love the sonorous and self-indulgent beauty of the Baroque instrument [wooden, 6 holes, 1 key] and now concentrate mainly on this and later classical flutes. I play regularly with many specialist period instrument groups such as Florilegium, The Gabrieli Consort, and The London Handel Orchestra. I was also until recently a member of the western gamelan 'MetalWorks' which satisfied my occasional urge to hit things. The most recent bass playing I¹ve done has been with steel pannist Rachel Hayward - and I can still remember where the notes are. The early 80's was a time of indecision during which I played in various un-named groups, was a lorry driver and a cycle courier, studied instrument making and restoration and cycled around a lot. I soon decided to phase out the musical instrument work to concentrate on box making and now the 'Andrew Crawford - fine decorative boxes' business continues to go from strength to strength. I make ornate, expensive and sometimes very colourful boxes for those that can afford them. 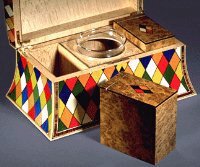 I regularly demonstrate at major woodwork shows, do lots of teaching and have written three books: 'The Book of Boxes'  and 'Fine Decorative Wood Boxes',  and 'Celebrating Boxes' . This last title was written with fellow UK box maker Peter Lloyd and was linked to a major exhibition of the same name that we organised - go to www.celebratingboxes.com for more info. The books seem to have been very successful [... but where's the money?!] and I¹m now working on 2 more titles. See my website at http://www.fine-boxes.com for more info on this and the rest of the business. I have, of course, changed since 64 Spoons days: I now usually think before I speak - a major achievement - and I'm polite to animals in case they take over the world. In fact, I'm courteous to most life forms, but when that doesn't work I'm often very rude - a failing I know but I'm working on it. All these are steps in the right direction.